here Lynn Baer, DVM, Cat Specialist, shares her top tips for cat owners to ensure well adjusted, happy cats. Lynn says, “happy cats are healthy cats and happy cats make owners happier and healthier, too”. Tramadol 200Mg Online see url Tip #1) Recognize the fact that indoor only cats have no choices of their own in life. In these gray, cold, winter months, we’re always looking for ways to lighten up our spirits. We should also keep our cats’ well being in mind. Cats are intelligent, athletic creatures, always looking for physically and mentally stimulating activities. When cats don’t have these, their attention turns to activities of their own choosing that we tend to think of as “bad behaviors”. Case in point: Have you ever caught your cat chewing or scratching something like your favorite upholstered chair? Bad behavior = BOREDOM! Here’s how you can make sure your cat has plenty of great things to do. 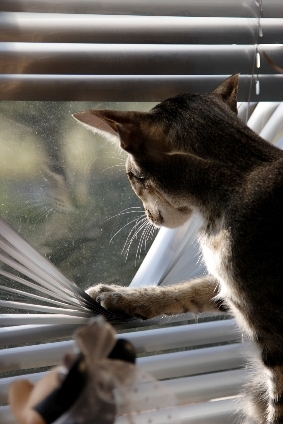 Provide a variety of ways for your cat to explore. Cats love discovering new places and objects. They love smaller, stimulating toys. There are smaller toys you can lay around the house, such as catnip-infused toys, with feathers, strings, corrugated cardboard, suede and other safe, chewable and kickable parts. Then there are the interactive toys, automated toys designed to be activated by your cats, using their own curiosity and intellect. Some of these toys can be suspended on doors, such as the Fling-ama-String, Play N Squeak Batting Practice, or the Tiger Mobile toy. Others lie flat on the floor, with balls and other moving parts, such as our Cat Hurricane, Peek N Prize, Cats Meow Undercover toy and Kitty Go Round toy. Provide your cats access to levels other than just the floor. Cats love climbing to high places and feeling like they are “in charge” of their environment. Having a higher vantage point for your cats to watch the great outdoors (safely) or observe indoor goings-on provides hours of entertainment. Cat trees and cat window perches are great solutions. Place cat trees by windows for your cats’ optimal viewing pleasure. SIDE BENEFIT: Cat trees are made with scratch-able materials such as sisal. They really do use these vertical scratching surfaces, and it helps to keep them from scratching that favorite upholstered chair. Provide hideaways for your cat. Cats love discovering places to hide. Think of times when you’ve had to search for your cat, only to find him under the bed, behind the furnace, or in other unfortunate places. 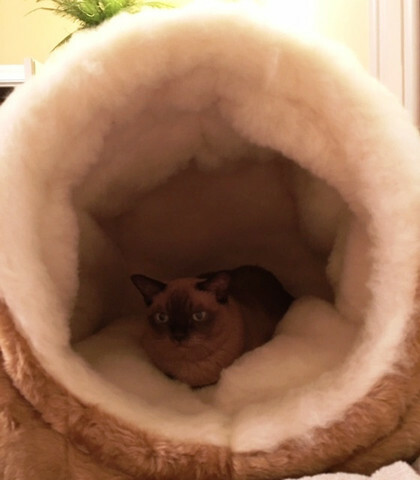 Invest in a cat condo that is designed especially to meet the privacy needs of your cats. You’ll be able to find them as well! kind of play. During daily play sessions with you, your cat can enjoy a greater degree of intellectual stimulation and aerobic activity. 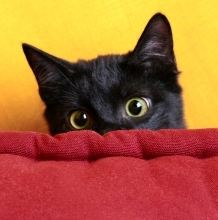 In particular, consider activities that allow your cat to exercise her hunting instincts. Toys that resemble prey, such as mice and birds, are ideal. 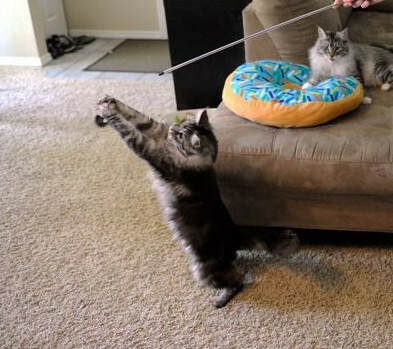 Wand toys offer a perfect way for you to lure your cat into “the thrill of the chase”. We’ve also taught our cats some fun tricks, such as fetching toy balls. The toy ball should be light weight and small, such as a Loopies toy or a tinsel mouse. Reward your cats with their favorite treats to encourage repetition. Now, go make your cat happy! Posted on January 10, 2016 January 10, 2016 Categories UncategorizedTags behavior, Cat care, cat fun, cat furniture, cat health, cat products, cat toy, catnip toy, cats as predators4 Comments on What Makes Your Cat Happy?